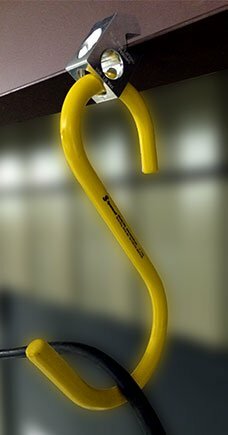 You’ve already taken the first step for eliminating trip hazards and preventing injuries by using our extra-large S hooks to keep your industrial workplace safety program OSHA compliant. The Spanwell Hang-It Clamp™ allows you to hang heavy duty S hooks in areas where only red iron or I-beam is available. When you’re working and welding in an area with no piping or conduit to throw an S hook over, you can attach the Hang-It Clamp to any I-beam or red iron with a ¾” flange thickness or less. Attach the hang-it clamp by hand tightening the set screw with an Allen wrench. The clamp’s set screw is a cup point, alloy set screw that you should never replace with any other style set screw, bolt or foreign object. Once you’ve installed the Clamp, be sure that the set screw is tightened properly and can sustain the planned load. Once the hang-it clamp is properly secured, place our 12” tall, SW1275 or 14” tall, SW14100, giant S hook into the clamp. Now you can easily string your welding lead along from S hook to S hook, above and away from walkways. Concentrate the load in the center or “saddle” of the lower part of the S Hook. Remember that Spanwell S Hooks are not load or lifting hooks; they’re organizational devices. Our industrial S hooks hang welding lead, air hose and electrical cable to help you meet OSHA safe housekeeping requirements, eliminate trip hazards and organize your workspace. The Spanwell Hang-it Clamp is made of solid aluminum and can be purchased in any quantity from our online store (Part number SW0050). Learn more about how to correctly hang Extra-Large S Hooks using the Hang-It Clamp.